In an uplifting speech focused on American achievement driven by the success of his first year in office, Donald J. Trump gave a rousing National ‘pep talk’ about the need to end partisanship and support his agenda that, for all intents and purposes, appears to be working on the domestic front at the very least. And if you were among those watching that were not about unity, and just simply hoping for the president to utter some bombastic statement, well, you’re probably still waiting in a bereft and forlorn state of shock. The president was masterful as ceremonial chief of parading American spirit and heroism to a worldwide audience. The president waxed poetically about the greatness of America while intertwining his heroic guests that he often referred to as “patriots”. From honoring the parents of the MS-13 attack on their daughter (gut-wrenching, but heartfelt) to CJ Martinez, Supervisory special agent for the United States Immigration and Customs Enforcement’s Homeland Security Investigations unit, whose investigations have led to the arrests of more than 100 MS-13 gang members. “Seong-ho traveled thousands of miles on crutches across China and Southeast Asia to freedom. Most of his family followed. 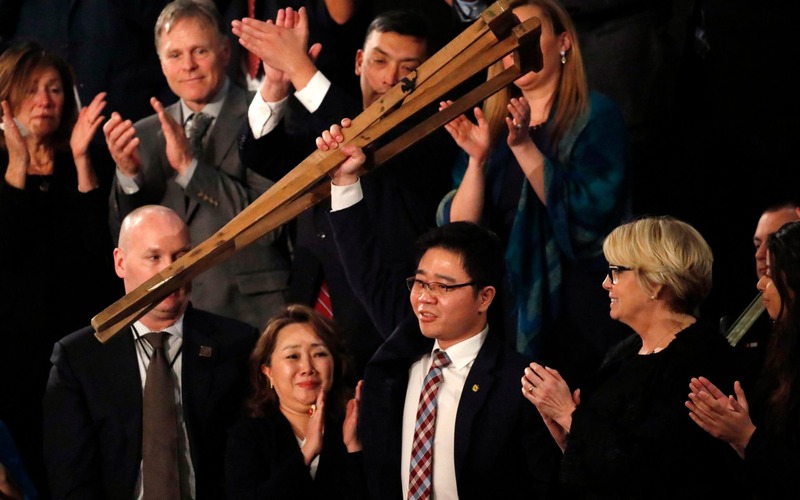 His father was caught trying to escape, and was tortured to death.” Trump continued, “Today he lives in Seoul, where he rescues other defectors, and broadcasts into North Korea what the regime fears the most – the truth.” Truly, a remarkable story of unimaginable suffering and courage amidst the most difficult of circumstances. From a policy standpoint, Mr. Trump outlined his focus for 2018. This agenda was highlighted by reiterating his flagship issue during the 2016 campaign: immigration reform. In what the president referred to as “The Four Pillars of Immigration Reform”, Donald J. Trump explained in detail how the execution of this plan would come about. The first three pillars of this plan include a path to citizenship, securing our borders, and the visa lottery. But, clearly the most controversial part of the plan was addressing the issue of chain migration and how this must be handled moving forward. “The fourth and final pillar.” He shared, “protects the nuclear family by ending chain migration. Under the current broken system, a single immigrant can bring in virtually unlimited numbers of distant relatives. Under our plan, we focus on the immediate family by limiting sponsorships to spouses and minor children. This vital reform is necessary, not just for our economy, but for our security, and our future.” This has been a sticking-point in working with the democrats, as many of them see the president’s stance on chain migration as racist. Other highlights of the address to the nation was his reference to faith and family. “In America, we know that faith and family, not government and bureaucracy, are the center of the American life. Our motto is “in God we trust.” This is something he shared back in May of 2017 speaking to graduates at Liberty University. In summary, this was the most uplifting celebration of American achievement and heroism at a State of the Union Address in my lifetime. When you measure his words and what he displayed as important, showcasing what he is about and what he intends to do as the leader of the free world, he could not have done any better! Donald J. Trump continues to surprise as a leader. When many wait with baited-breath for him to fail or provide a soundbite that will paint him as incompetent and aloof, he continues to put his best foot forward and display what has made America great since the time of our inception.